Learn the creative designing, manipulating and retouching photos tips and tricks with new tutorials, each tutorial is helpful for beginner and advanced users. 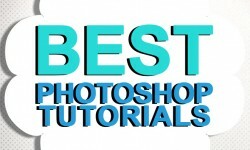 All tutorials are created by talented graphic designers around the world. Take a look at these new illustrator, indesign and Photoshop CC tutorials and see how these tutorials are helpful in knowing these techniques. Still as popular as ever, photomontage is initially one of the easiest techniques to learn. But achieving photorealistic results can be a challenge. In this tutorial, Mike Harrison shows you how, by blending a number of photos together. This kind of work always has a surreal edge, but with the images you’ll use, the environment and composition, you’ll endeavour to be quite subtle, too, which should add an extra intriguing quality to the piece. It doesn’t take much to make a great looking piece if you have a strong initial concept and some nifty tricks to cover the technical side. In this tutorial Arturas Petkevicius shows you quick and easy techniques ranging from the Warp tool to clipping masks and adjustment layers to create a stunning final image. Get ready to create an epic battle between a sea creature and a courageous pirate girl. I will share you various tips and techniques that will hopefully improve your current workflow. In this tutorial I will make extensive use of layers, masks, smart objects and other basic Photoshop tools so if you’re not familiar with them I recommend you read my article. If you’re not using custom Photoshop brushes already, then you’re missing out on one of Photoshop’s most useful features: used well, they will bring flair and individuality to your designs – as well as saving you a lot of time. Recently, French illustrator Marguerite Sauvage created a series of portraits called Flower Women, which she describes as “fashionable, traditional-looking, very feminine”. Here she takes us through the development of one of them, Sylvie. You may get large 9,5″x 7.5″ layered and editable .psd* file of “Halloween Card Photoshop tutorial by making a payment. Put the tutorial title in “Add special instructions to seller” line of PayPal and it will be sent to you shortly. The traditional cyborg, a mix of human and machine, has the ability to unsettle viewers in a way that robots or other synthetic humanoids can’t possibly match. There’s a visceral quality about the transplanting of flesh and metal in iconic figures such as The Terminator or Star Trek’s Borg. It conjures up visions of the horror of Victorian medical practices, and frightens us more than the completely synthetic Replicants of Blade Runner, or the Cylons from Battlestar Galactica. Alice in Wonderland is full of dreamlike, grotesquely distorted characters. In this tutorial, Fabio Sasso shows you how to hone your use of the Liquify filter to make an image of the Cheshire Cat that’s more like Tim Burton’s vision of Alice than Sir John Tenniel’s. A small character can tell a big story – but traditional character art can be rather flat and one-dimensional, tending towards a cartoonish feel. Include some fun in your Photoshop learning with the help of this awesome Photoshop tutorial published at PhotoshopTutorials.ws. This tutorial will help you to convert a portrait into funny caricature artwork that will not only look funny but also artistic. Autumn season is most romantic seasons where all colors are bright and give an accent to the surroundings. This tutorial written by Rose, will help you to create a realistic looking autumn leave text effect using leaf images, textures, lighting effects and adjustment layers. In this tutorial, Dwayne Bell details how to use Photoshop to enhance a hand-drawn illustration by digitally applying textures and patterns. This tutorial at PhotoshopTutorials.ws will help you to create a sprit ritual scene in Photoshop in which you’ll change daylight image into a dark night scene using lighting effects, painting and blending techniques. This Photoshop tutorial is coming from the expertise of Peter Braeley that will help you to create a moody environment using some simple techniques. Do you love trekking in the snowy mountains and if you do, we are sure you must have seen many landslides and avalanches while you are on the trek. How about creating one scene using stock photos, lightning and extraction methods. This tutorial by Neil Duerden will help you create an old-school Photoshop artwork using some old techniques and Multiply’s blending mode. Spotted at PhotoshopTutorials.ws, this tutorial is inspired by the superhero and will help you create an awesome Catwoman poster in Photoshop. Another photo manipulation tutorial from Jenny Le that will help you create a sci-fi outer space scene from scratch in Photoshop that feature planets, spaceships and nebulae. This Photoshop tutorial will help you learn to create a fantasy angel scene combining various stock images, using adjustment layers, masking and blending techniques.